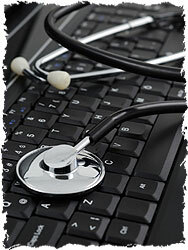 Access to real-time provider data through your internet browser, with an on-line editing capability. Click here for a Folio IS Trial. Using an advanced library of customized software programs, Folio routinely and systematically matches its own unique physician and facility identifiers with other electronic database identifiers such as National Provider Identifiers (NPIs), Unique Physician Identifier Numbers (UPINs), Drug Enforcement Agency identifiers (DEA), state board licensure numbers, and with the proprietary identifiers of many data license customers. The result is that Folio brings to bear all relevant electronic information in evaluating, building and validating its physician databases. But all electronic files (including web gathered files) have weaknesses in the form of outdated information, redundant or duplicate information, incomplete information, conflicting information, or simple input errors. That is why Folio stresses direct verification of all physician information through an annual verification form, followed by phone contact from a dedicated on-site and knowledgeable Data Research staff. In this process Folio not only develops the census of physicians practicing in an area but also gathers proprietary information that is simply unavailable elsewhere. Using Folio IS interactive tools, users can now ‘drill down’ from a group practice to its individual providers and print out individual PDF profiles. Not sure of a Physician name or address? Folio IS will conduct an online search to answer your request. Folio IS: used by healthcare professionals for accurate and coordinated Physician communications, billing, medical records, clinical care coordination, health reporting, claims adjudication, central data warehousing, and strategic planning. Copyright 2019 FolioMed. All rights reserved.